Description: Rare reissue with the original 10-inch LP jacket design! 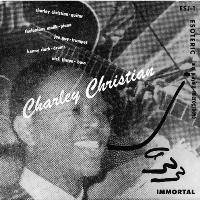 The famous, epoch-making "Minton's Playhouse" jam sessions by Charlie Christian (whose name was prominently misspelled on the jacket), Dizzy Gillespie and others were recorded in May 1941 by a college student. It captured the birth of bebop, the shift from two-beat to the now-standard four-beat rhythm, and the revolutionary guitar playing by Christian. Some of the recorded materials had been issued on many formats, including the 78 rpm box set in 1947, a 10-inch LP in 1951, and a 12-inch LP in 1956. This Japanese reissue CD gathers all of the nine tracks and has the 10-inch LP jacket design in a mini-LP (paper sleeve) package. Recent research concluded that Thelonious Monk, long thought to have participated in some of these sessions, was not present. But that does not diminish the historic value of these recordings as a vivid document of a new form of music being born. Recorded in at Minton's Playhouse and Monroe's Uptown House in New York in May 1941. This reissue released in Japan by SSJ Records in 2015. Mono.